There is a huge amount of information in this Outer Mountain Loop board in the many excellent threads, please take the time to look through them. This sticky is to help bring some of this information into one place and to direct you to other sources and threads. The National Park Service is now telling people that over 50% of the folks who start the OML don’t finish. Good research and information will help you make good decisions and have an enjoyable and safe trip. There is also incorrect information out there from sources like Backpacker magazine and even the NPS that we hope to dispel. This is not intended to be the last word in all things OML, just to answer some of the most common questions. We encourage you, especially people new to Big Bend Chat, to ask more questions or for clarification of what is below but please do it in a new topic post. Please only post in this thread things to improve/clarify the information here. I also encourage those NPS employees that monitor Big Bend Chat to give clarifications too. The longest backpacking loop completely on established trails in Big Bend National Park. It is usually the primary choice, for a backpacking trip, for first time visitors to the park. It is the Big Bend regions most publicized hike, online and in magazines and people come from far and wide just to do the OML. It is so exclusively publicized that some people actually ask if there is anything else to do in the 800,000 acre park, the answer is there are many things to see and do but the OML is maybe the perfect introduction to the parks geography, ecosystems and to desert backpacking. The OML is not one single trail but a combination of trails. All variations of the loop include the Blue Creek trail, the Dodson trail and the Juniper Canyon trail, they are the Outer Mountain part. How you connect the Blue Creek and Juniper Canyon trails together in and through the Chisos mountains depends on what trailhead you start at and if you want to see the South Rim or not. How long is the OML? That depends on which trailhead you start at and what trails you take in the high Chisos. It can be as short as 25 miles and as long as 41-43 miles if you include the Southwest, Southeast, Northeast Rims and climb Emory Peak. Here is the NPS suggested itinerary which is 32 miles. See the mileage logs below. The Blue Creek (5.8 miles), Dodson (10.9 miles) and the Juniper Canyon (6.7) trails together are 23.4 miles. How many days does it take to hike the OML? The NPS itinerary is 3 days 2 nights but does not include the South Rim. It has been done in one day and as many as 6. Many people will suggest a more leisurely pace of 4 days 3 nights with a night on the South Rim or in the high Chisos somewhere and two in the lower desert. It also depends on if you get an early start the first day or drive in and start later in the day after getting a permit and caching water at Homer Wilson. Read the OML trip reports in the Trip Report Indexes to get a feel for different people’s experiences and itineraries. While the loop is not huge mileage it does have something like 8000’ of elevation gain and loss with some rough trail tread in places. If you can, take the time to enjoy it, not race through it. When to hike the OML? The Dodson is brutally hot May-September. There are a few people who do the loop in April and October but it is also generally very hot and unpleasant across the Dodson, it can be done but it will probably mean very early daily start times, extra water and maybe taking the middle of the day off somewhere in the shade (not much shade on the Dodson). In the trip reports index you will see that most people do it November-March but even March can get hot down on the Dodson. Everyone should read this trip report if planning a hot weather trip. Conversely, if you want to camp in the Chisos you may have to watch the weather in December and January as winter storms do occasionally make it very cold and some snow. You may have to adjust your plans accordingly. The rainy season is generally June-October which means the natural water sources tend to have less water the farther into spring you go. The driest months of the year correspond to the best OML hiking season which means the possibility of a lighter pack without rain gear or tent. The most common starting point is in the Basin at 5400’, parking your car near the Basin Store and Visitor Center. You will ascend into the high Chisos by either the Laguna Meadows trail (more gradual with a 1300’ initial, 3.8 mile, climb to Laguna Meadows) or the Pinnacles trail (steeper with a 1600’ initial, 3.2 mile, climb to Pinnacle pass near the Emory Peak side trail). There is a campground in the Basin (and the lodge) for those camping before or after doing the loop. Homer Wilson Blue Creek Ranch house overlook on the Ross Maxwell Scenic Drive. This is at the junction of the Blue Creek canyon trail and the western end of the Dodson trail and the bottom of Blue Creek Canyon at 4200’. Going clockwise you have a 2500’ climb up Blue Creek canyon. Going counter-clockwise you have an initial climb of 1000’ to the first high point at ~2.6 miles, which is very exposed/hot in the afternoon. There are no roadside campsites nearby, Croton Springs is the closest. Juniper Canyon trailhead (4000’) at the end of the dirt Juniper Canyon road which is off the dirt Glenn Springs road and a total of 12 miles from the paved road between Panther Junction and Boquillas. These roads are only recommended for high clearance vehicles but many a passenger car has made it out there. Just remember a tow truck there will cost you hundreds of dollars. This is the least common starting point at the junction of the bottom of Juniper Canyon trail and the eastern end of the Dodson. Going clockwise it is a rolling trail going west. Going counter-clockwise it is a 3100’ climb. The Twisted Shoe roadside campsite is located near the trailhead for those wishing to camp before starting the loop. If you start at either Homer Wilson or Juniper Canyon there is no need to drop into the Basin and then climb back out again. You should be able to resupply with water in Boot Canyon and it takes at least 6 miles off the standard NPS trip. It is completely safe to leave vehicles at any of the three trailheads for extended periods. The NPS itinerary is clockwise around the loop. The decision here mostly revolves around water sources, which canyon access to the Chisos you want to go up or down and what time of day you will make those climbs based on your itinerary. Blue Creek canyon is shorter with a very steep drop/climb in the upper mile. Overall it climbs at 431’ per mile. The lower mile or so is through loose gravel in the washes which is tiring to walk through especially going uphill and the upper part of the canyon is very exposed and hot in the afternoon. Juniper Canyon is slightly longer with 600’ more elevation gain. Overall it climbs at 462’ per mile. The lower ~3 miles are gradual and along the remnants of an old road and is very exposed in the afternoon. The upper three miles drop/climb steadily but with excellent trail and is shadier in the afternoon, only the last .2 mile, near Boot Canyon, drops/climbs steeply over rough trail. The Dodson has many ups and downs but is somewhat more gradual going east to west to the high point at about 5250’. 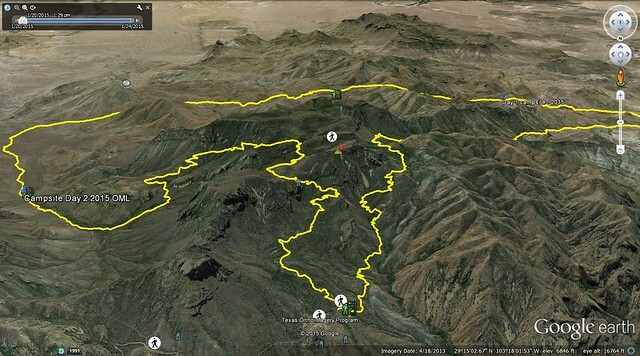 Should I include the South Rim and/or climb Emory Peak? Yes if you have the time. One of the failures of the NPS suggested itinerary is that it does not go by the South Rim, the premier view in the whole park. You should at least walk by it, either at the beginning or the end of the loop, camping at one of the designated sites is even better to enjoy sunrise or sunset. Some people like to do it before dropping down into the desert to see where they are going, others like to do it after they have crossed the Dodson to see where they have been. It only adds a few miles onto the standard trip. During Peregrine Falcon nesting season the Southeast Rim is closed (Feb. 1st-May 31st) but you can still walk the Southwest Rim and up or down Boot Canyon. Climbing Emory Peak is another add on and if you have to choose, most folks think the view is better from the South Rim. With the new trail it is an additional 3 miles, roundtrip, and 800’ climb. Unless you are camping in the Chisos the first night most people will do it on the way back to the Basin. For planning purposes the old EP1 campsite no longer exists. If you do the NPS itinerary and want to hike either the South Rim or Emory Peak at the end of the loop it is very tempting to skip them after you climb back up into the Chisos and just head downhill to a shower and other comforts instead. Regardless of what direction you travel, everyone should cache water in the bear box, down the trail, below the parking area at the Homer Wilson overlook. Labeled with your name and the date you will pick it up. You can no longer leave food and other items in the box and you need to retrieve anything left in the box after the trip. It is 24 road miles from the Basin and 21 from Panther Junction, one way. Some people, if they have the proper vehicle and time, will also cache water in the bear box at the Juniper canyon trailhead. It is 17.5 miles from PJ (about 2 hours round trip) and 26.5 from the Basin. Of course there is water at the Basin visitor center. Always check for current spring reports here on BBC and/or ask at the visitor centers. The Park Service is irregular in giving current information, sometimes very accurate and others the standard “No water anywhere, carry all you need”. I only rely on reports less than a month old and you never want to arrive at a spring out of water unless you are sure there is water there, you need to have enough water to get to the next known source. That being said you should not need to carry more than 4-6 quarts/liters per person at any time for a 3-4 day trip unless it is very hot weather and/or there are no good reports on water sources. Boot Spring- sometimes runs out of the pipe just past the cabin. Boot canyon pools/tinajas upstream from the spring almost always have water in them. Most of them are in the .4 miles between the Juniper Canyon trail junction and the Northeast Rim trail junction. Upper Juniper Spring is 2.6 miles going down the Juniper Canyon trail on the right side, marked with a sign that says "No Camping Here; Zone Camping begins 0.25 mi below". It is fairly reliable. Here is a description of how to find it. Fresno Creek is 4.7 miles from the eastern end of the Dodson (Juniper Canyon trailhead) and 6.2 miles from the western end (Homer Wilson trailhead), many times water will run across the trail but there is essentially always some water in the wash/canyon below the trail. Please do not camp near the creek. In wetter years there is a spring about 15 minutes down the Smoky Creek trail from its junction with the Dodson. For the NPS itinerary carry enough water to get from the Basin to Boot Spring/Canyon or all the way to Fresno Creek (assuming a report that it has water and you haven’t cached water at Juniper canyon trailhead). From there enough to get to your cache at Homer Wilson. From there enough to Boot Spring/Canyon again or all the way to the Basin. Here is a good thread on how much water is needed. Yes you have to have a permit. You get them for $12 at the Basin visitor center or Panther Junction but you may get better water information at Panther Junction. You can only get them in person and no more than 24 hours in advance. If you are a solo hiker be prepared for extra grilling. They may ask you to fill out an additional solo hiker form and for them to take pictures of your boot print and equipment but is is not required. You have to return your permit/check in within 12 hours of leaving the backcountry. Even with a group you should always leave your plans with someone who can call if you don’t report in. You will need to know your itinerary and where you will camp, at least in general what zone you will camp in or exactly which Chisos designated campsite you want. In the high Chisos you have to camp in the designated sites. Here is a description of all the high Chisos campsites. CO3 is the Juniper Canyon zone. It starts below Upper Juniper spring and the "No Camping Here" sign and extends down to the Juniper Canyon trailhead. You cannot camp between the designated site JC1 and Upper Juniper spring. CO4 is the Dodson zone, it extends from Juniper Canyon trailhead to the Homer Wilson Ranch house. CO5 is the Blue Creek canyon zone and runs from Homer Wilson to the base of the last big climb up to Laguna Meadows at about 5600’ and 4.5 miles up canyon from HW. You cannot camp between here and the designated site BL1. There are numerous established/well used campsites along lower Juniper and along the eastern Dodson. Fewer along the western Dodson and very few in Blue Creek. Technically you are supposed to camp 100 yards from the trail but by Leave No Trace principles you should not make new sites but use already existing ones. In practice most folks use the established sites near the trail. That said no camping within 100 yards of the Dodson ranch house, the Homer Wilson ranch house and the Fresno creek crossing. Big Bend is mostly critter free, as far as food is concerned, compared to other national parks. Very little trouble with rodents, etc. The two major animal problems are javelina and black bears. Sometimes javelina want to check out your tent and bears, which are primarily in the Chisos, are after food and occasionally your stinky boots. In the designated campsites in the high Chisos there are bear boxes and you are required to store all your food and other scented items in them. In the lower desert zones you need to keep your food “closely attended”, which means near you at all times. If you want to go for a day hike you will need to take your food and scented items with you or carry an approved bear resistant container to leave it in camp unattended. This is a new regulation in 2014. If you cache food and water, other than in the bear boxes at the trailheads, then both the food and water have to be in a bear resistant container. Here is the NPS Food Storage page. Do not try to hang your food or bury it, just keep it close by, but not in your tent or sleeping bag. I don’t believe there has been a single backpacker on Big Bend Chat who has lost food to a bear (or javelina) in the lower desert. Why do people not complete the OML? There are many reasons but most of them are probably due to inadequate research, preparation and underestimating the difficulty of the loop. Many are probably new to backpacking and/or to desert conditions. The elevation gain/loss and the intense desert climate, more than other reasons, wear people down. Most bail at Homer Wilson after crossing the Dodson and the combination of the weather (heat/sun) and facing the 2500’ climb up Blue Creek canyon. If there is one tip that members here have is to reduce your pack weight as much as possible. Carry only what you really need. If the forecast is for dry weather then consider not carrying a tent or rain gear and only enough clothing to be comfortable. A tarp is all you really need unless the rare winter storm is forecast. A light pack will allow you to more comfortably carry the water needed. Water is 8 pounds per gallon so you want to be smart about caching water and using natural water sources to reduce the amount of water you have to carry at any one time. Get in shape, starting weeks in advance, walk with your pack and the shoes/boots you will use. Study the map and the route and become familiar with the landmarks, the water sources and the elevation changes. It is a great walk, have a good time! And Please give us some kind of trip report (or a link to a report) or at least a water report! The trails in the Chisos, the Juniper Canyon trail and most of the Blue Creek trail are so well defined that they are impossible to lose. If you do then you should not be hiking the OML. The Dodson and some of lower Blue Creek are also pretty well defined but can be confusing when walking in the washes or crossing them. There are many cairns marking the trail, keep an eye out for them and return to the last one you saw if you think you have lost the trail. There are metal signs at all the trail junctions. The most confusing intersection is the Smoky Creek trail and Dodson trail. If going clockwise you will be walking down the wash, which is Smoky Creek, and the Dodson will exit to the right out of the wash. Many people have missed the sign and cairns and continued on down the wash which is now the Smoky Creek trail, also with cairns. Keep your eyes peeled here. The Trails Illustrated map is not the best for good navigation, the scale is a bit smaller and is not as detailed as a USGS topographic map, it is fine for larger scale identification of land marks though. A 7.5 minute, 1:24,000 scale map is the best. Standard USGS Quads can be purchased at PJ or ordered online, for the OML all you need is the Emory Peak quad. You can also have maps printed off the web. Here is one from Caltopo and here is another set ready for printing. Here is the elevation profile of the entire loop for reference. Here are some GPS Google Earth shots of the trip. Ended up being 32.5 miles with an elevation gain & loss of 7,638 feet. These are newly modified based on new data from both the NPS website and on the ground gps readings. 4.4 27.6 Junction with Juniper Canyon trail, if no water in Boot Spring there are large pools in the next .4 miles up the Boot Canyon trail before the Northeast Rim trail jct. 3.5 0.4 Junction with Northeast Rim trail, water in pools next .5 miles. OK folks, this is still a work in progress. I am sure I have editing to do and need you all to check my facts and other details. Let me know what I need to change or add and I will make the edits. Richard if we can make this a sticky that would be great. As I said at the start, please only post in this thread things we need to do to edit/improve this document and post a new topic if there are other questions you need answered. I in no way want to short circuit discussion and trip planning for folks, just to have some information in one place. In the first post, in the section about water caching, the last sentence refers to a thread about how much water to carry, but the link is missing. The Trails Illustrated map is not sufficient for good navigation, the scale is too small, it is fine for larger scale identification of land marks. A 7.5 minute, 1:24,000 scale map is the best. The back side of my (admittedly old) Trails Illustrated map has the entire OML at 1:24,000. Have the TI maps changed? Thanks Hayduke. I checked my oldish (2008) TI map and you are right, sort of, mine is "approximate scale 1:27,500". It just seems not very detailed. I will wordsmith that part a bit. Catz- thanks for catching that, I have it corrected. I have re-figured the mileage logs based on the new mileages from the NPS Chisos Mountians Map, gps mileages from badknees, and info taken from several sources including Caltopo. Some trails I used an average of some numbers. I used 6.7 miles for the Juniper Canyon trail vs. the old 6.2. I used 10.9 for the Dodson vs. Parents 9.9 and NPS published 10. I used 5.8 for Blue Creek vs. the old 5.5. The total for the NPS loop now comes out to 32 miles from 30. If any of you have more really solid gps numbers, especially of points along the route to dial it would be great. I think a lot of the gps discrepancies come from how often or far apart the gps takes a reading.